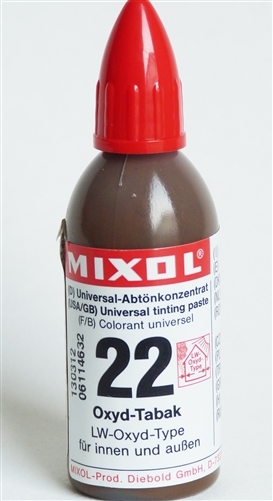 Mixol Universal Pigment, #22 Oxide Tobacco, sample size 20ml bottle. Made in Germany. Note on shipping cost here: If you are ordering only one of these, the online shipping generator will be WAY off! Please ignore that number and we will get you the correct shipping at the time we are ready to ship. Your card will not be charged until the correct amount is agreed upon.